By Amanda Glenn 94 Comments July 9, 2017 This post may contain affiliate links. When I was pumping seven or eight times per day, I really looked forward to the time when I could drop a pumping session. Even though I planned to keep my total amount of pumping time in a day the same, it’s still a pain to stop what you’re doing, find a place to pump (if you’re not home), get hooked up to/unhooked from the pump, and store the milk. It’s so much easier to do that four times a day than eight! Making the decision to drop a pumping session when you’re concerned about your milk supply can be hard. Here are some things to consider. What will happen to my milk supply if I drop a pumping session? As much as I wanted to drop a pumping session, I also worried about how it would impact my supply. The thing is, you never know what’s going to happen as far as supply goes when you drop a pumping session until you drop it (and sometimes, you don’t really know until a few weeks later) – it could go down, it could stay the same, or it could even increase. So how to decide to drop a pump when you don’t know what it will do to your supply? 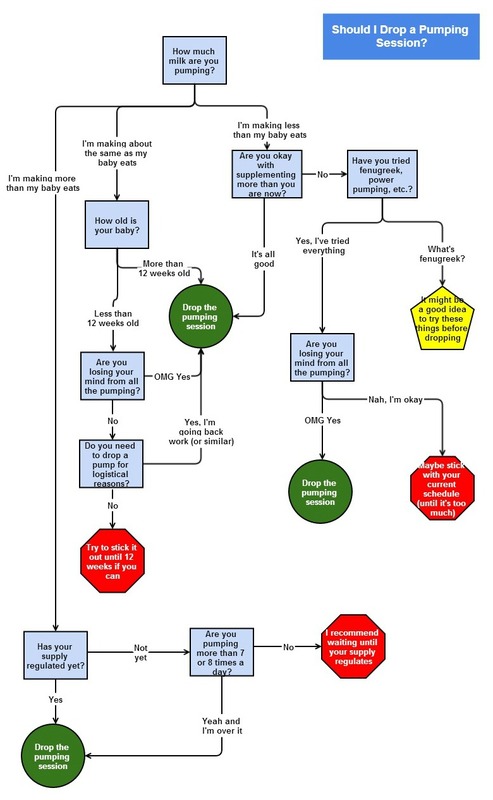 I put together the below flowchart based on my experience (my own and what I learned from reading exclusive pumping message boards for over a year). One thing that I firmly believe (and tried to reflect above) is that if you are losing your mind from pumping too much (or just don’t want to pump so much), that trumps everything else – you should drop a pumping session. The most important thing that you can give your baby is a happy YOU – not an extra two ounces of breast milk. 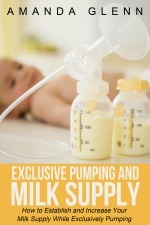 The first is that you want to maintain your supply – if you’re trying to wean, you aren’t concerned with keeping your supply (in fact, you’re actively trying to make it go down), and you should therefore ignore this chart and drop sessions as quickly as you can without getting clogged ducts or mastitis. The second assumption is that you haven’t already dropped a pumping session within the last two weeks. If you have, I would recommend waiting at least that long, and preferably a little longer. I’ve decided to drop a pumping session. How do I do that? If you aren’t prone to clogged ducts or mastitis, cold turkey may the be the easiest method. However, if you’ve ever dealt with either, slowly reducing time or volume would probably be a better option. Finally, remember that when you drop a pumping session, unless you’re weaning, you should always keep your total amount of pumping time in a day the same! Add the time from your dropped session back to the other sessions in order to maintain your milk supply. Ok cool! One other question – is your supply a thing that once it starts to dip you can never get it back? Or if it dips you just have to make the pump your best friend, get back on it, and you’ll be able to recover? I’m about 6 weeks post partum and Ive been exclusively pumping for about 25 min 5x a day consistently and producing about 28 ounces. I try to give her the breast once a day, but she doesn’t really take to it other than for comfort. My baby eats on average 18-24, so I have been thinking that’s good and I’m getting away with a not so stressful pumping schedule. Since I’m pumping enough and still doing it 5 times a day the last few days I’ve dropped the evening pumping. I always try to make up for a pumping I missed with either a longer session or an extra one at a new time. I see some mothers here are up to 50 oz, should I be pushing through adding more sessions until I’m producing more like that or is what I’m doing fine? Hi, this website has been great thank you! I would love some advice on dropping a pump. My baby is 7 weeks old. I pumped 8 or more times a day for the first 4 weeks and then dropped to 7 a day 3 weeks ago. During those 3 weeks I had a few random days where I pumped 8 times but mostly it was 7. I have an oversupply. I dont mind if it goes down a little but I want to be able to continue having a frozen supply. In those three weeks my supply has been between 33 and 43 oz a day, generally trending up each day. In the last two weeks I’ve pumped between 41oz and 43 oz a day. Individual pumps do vary but follow the pattern of decreasing from 3am till midday and then increasing thereafter. I think I’ve regulated as the amount seems consistent but my breasts have only leaked a handful of times in the last 7 weeks and have only felt hard a handful as well. Should I wait longer to drop to 6 since I’ve only been at 7 for 3 weeks and I’m only 7 weeks post partum? Hi Nikki! I think that schedule looks great! How long are your sessions? Your baby is still so little that a lot of the herbal methods (like fenugreek) might work well, if you’re worried? I try to keep it to 15-20 min per pumping session (especially at work). But I noticed a couple of times a day my milk is still spraying pretty heavily for 30-40 minutes. I noticed it is mostly at my noon pump and my 4 am pump. 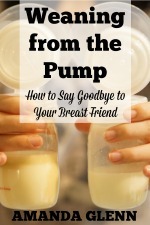 I recently switched to 10 pumps a day when I started keeping up with baby. Should I switch to every 3 hours instead of every 2? I think you definitely can. Every 2 is just too much to keep up with! Hi, I am new to EPing. My son is 3 months old but I have only been eping for 1 month. My supply tanked when I had surgery a month ago so I have been pumping every 2 hours around the clock. That’s how often he eats and I was having to supplement while in recovery. I am finally getting to the point where I am making(about 40oz/day) more than he eats (about 30 oz/day). Sometimes my sessions last 40 min now that my supply is up, the milk just keeps flowing. How do I cut pumps if I am pumping for up to 3 hours a day? I am afraid that I will lose my supply since I have only been producing the 40 oz for about a week. Hi! That is awesome that you were able to get your supply back up! YAY! My initial thought is to drop one session at a time, and only add the time to the remaining pumping sessions maybe every other time – while reevaluating as you go. So are you currently pumping 12 times a day, for up to 40 minutes? I think I need more details. I wanted to thank you for all the advice and motivation you have here for us. I have been exclusively pumping for my baby since he was 2 weeks old. I had plans to give up, since it was becoming very painful. However, the experiences of so many mothers pumping exclusively and your advice on this website kept me going. My baby turns 9 months in couple weeks, and I am still pumping, and have not had to give him formula yet. I pumped 3 times for 2 months (45 mts each session) and was still producing 28-20 ounces a day. Now I pump twice a day and get around 18 ozs a day. Thanks to the excess supply before 6 months, I still have a few hundred ounces in the freezer. I am finally planning to wean off in couple weeks. Really happy about breastfeeding my baby for 9 months at least. For women who are struggling with supply early on, I just wanted to let them know that the supply goes up if you pump consistently. At 2 weeks, I was producing only 16-18 ozs a day. By the time my baby was 2 months, my supply had gone up to 40-42 ozs a day. It was gradual and i saw a few ozs increase every week. Also, I used the fenugreek tablets and shatavari which helped with the supply too. Yay! So glad to hear that things are going well! Hi Sami! I think that’s fine. No worries about spacing the sessions equally – babies don’t space their equally either! I think the schedule looks great. Sounds good. I will wait for another 2 weeks. Thanks Amanda! Thanks Amanda! I will be doing that from today. If the supply drops, I am assuming I don’t have to do that anymore. Also, I moved to 5 sessions 3 days ago. When do you think I could move to 4? I pump for an hour for the two sessions after long gaps currently and 40-45 minutes for the sessions after short gaps. When I move to 4, I will pump for an hour at each session. LO is 10 weeks old currently. I plan to give breast milk to my LO till he is 6 months old. After that, if I can’t handle it anymore, I may just move him to formula. Hi! I think maybe around the 12 week mark? My baby is 10 weeks old. He is far from eating solids. I do wait for two letdowns after milk stops flowing, so 3 in all including the one in the beginning. Got it! I think you’re doing all the right things. I think discarding the first few ounces made sense. You could maybe freeze them for when your baby does start eating solids. That’s the only idea I have, sorry. Thanks for your response. I was trying out some things all these days to see if the green poop goes away. I am pretty sure now that the green poop is due to foremilk hindmilk imbalance. After cutting down to 5 sessions, the green poops have increased since I am going pretty long between pumps (at least 2 sessions). My times now are 5.30 am, 10 am, 1 pm, 4 pm, 10 pm. The sessions at 5.30 am and 10 pm are after long gaps, hence my breasts have a lot of foremilk then. When I store the milk from these sessions in the fridge, I see a very thin layer of fat and mostly bluish greenish water. I read that the emptier your breasts are, the fattier the milk is. It is not possible for me to pump more than 5 times at this stage. I get around 12 ozs of milk in the morning session at 5.30 and around 8 ozs in the night session at 10 pm. I was thinking of discarding the first 2-4 ounces in these sessions to lessen the foremilk. Is there any way I can use this foremilk? Can I add a teaspoon of formula to it and feed the baby? That way he will get some calories as well as the antibodies. I hate to discard any breast milk, so wanted to check what I could do. I don’t think you need to pump more than five times a day. You might be able to get more fatty milk at the end of your five sessions? How many letdowns do you get? I dropped the middle of the night session 10 days ago. I now pump at 4.30-5 in the morning followed by 10 am, 1 pm, 4 pm, 7 pm, 10 pm. Earlier I used to wake up at 2.30 am and pump followed by another one at 6.30 am. I still get 35 ozs a day. LO drinks a max of 30 ozs, so I have managed to collect 350 ozs in the freezer. The only problem is that his poop is green at times which means that I may not have great fatty milk because of the long gaps. I was wondering if I could drop the 7 pm session too since that is the time I need to spend with my 5 year old. Is it too early to drop it? My LO is 9 weeks old. I still pump for 40-45 minutes each session and try and get at least one let down after milk stops flowing. Thanks so much for all your advice. Hi Sami! So glad to hear that you were able to drop the night session. Regarding the green poop, the long gaps should actually get your fattier milk – the fuller your breast, the fattier the milk. Is there any chance that the fattier milk is the 5oz that’s getting stored every day? OR it could be that the green poop is unrelated to milk, maybe? My kids always got green poop when they were coming down with something? Regarding going down to 5pp at 9 weeks, I think that’s okay given how long you’re pumping. Good luck! Thanks Amanda! I dropped to 6 sessions today. Let’s see how it goes. Thanks Amanda! My supply went up a little and now I am making 32 ozs in 7 sessions. I did add one more dose of shatavari, so that might have helped too. However, I still have to go at least 35-40 mts for 4 ozs in each session (I started off with 2 ozs in each session almost 5 weeks ago). Baby will be 7 weeks on sat, and the help I had will no longer be there after he turns 8 weeks old. There are a lot of articles which talk about supply getting established. What exactly is that? Also if pumping mimics breastfeeding, babies start eating more and going longer intervals after they turn 2 months, right? Can’t I drop my pumping sessions to 5 from 7 to mimic the baby behavior then? Will that hurt my supply? I would also like to drop the middle of the night session because that’s taking a toll on me 🙁 Thanks again for all your advice. Hi Sami! That’s great news! They say supply is established around 12 weeks but I think tends to be a bit earlier, probably by 8-10 weeks in most cases. I think you can drop down to 6 sessions now and drop the middle of the night one in the next few weeks. Good luck! Thank you so much Amanda for your prompt response and tips. I have tried going back and forth between letdown and expression phases but that has not helped. I looked up some videos for hand expression and could not really do it. My breasts feel empty most of the time. The only thing which has slightly helped since yesterday is increasing the suction strength while pumping. I manage to get 2.5 ounces – 3 ounces overall in 25- 30 minutes. However, if I go for another 15 minutes I do get 1-2 small letdowns. I am planning to stop pumping at 30 minutes. Do you think my supply will be affected if I miss those 1-2 small letdowns? I am going to do whatever it takes till 8 weeks are done. After that I wlll have to move to max 5 sessions a day since I won’t have any help. I am preparing myself to give LO formula after 8 weeks if needed. My right breast is slow in giving out milk. Even when LO fed from it, he used to get frustrated a lot of times. Hi! I think your supply would probably be better if you kept going for those 1-2 small letdowns, but I know that can be a lot. I guess I would just keep going if you can, but don’t beat yourself up about it if you can’t – that’s a super long time to be pumping! Thanks for such a great post. My son was exclusively nursing till he was 2 weeks old. However he was very lethargic and did not transfer well, so I started pumping and giving him some bottles. He was gaining weight very slowly. He got so used to the bottles that he refused to nurse after that making me an exclusive pumper. He is a little over 4 weeks now. I pump 7 times and get a total of 20-24 ozs in a day. This is sufficient for him so far but has taken a toll on me. My each session lasts 40-45 mts since the letdown happens only after 30 minutes. I pump at 7 am, 9.30 am, 12 pm, 2.30 pm, 6 pm, 9.30 pm and 2.30 am. I have been taking all possible milk supply boosters. I have a 5 year old kid who is very needy at this point too. I have some help till the baby turns 8 weeks old but after that I am on my own. I get some sleep at night – 5 hrs in all in 2.5 hr stretches if the baby sleeps too. Baby does not have a schedule yet, so he is fed a bottle when he shows hunger cues. Overall this is getting very tough for me physically as well as mentally. I am not sure if dropping couple sessions will reduce the supply drastically. I can go like this at the most till 8 weeks since I have some help till then but definitely not after that. Also, I use hot compress before pumping and use compressions throughout the pumping duration. The flanges are the right size too. I feel I have exhausted all options. I am so miserable right now. Any help from you, Amanda, will be greatly appreciated. Thanks a ton! Hi Sami! Wow, 7 sessions of 45 minutes each sounds terrible and totally unsustainable. I’m sure you’ve tried this, but have you switched it back and forth between the expression and letdown phases? Like, done one for a few minutes then switched it to the other? Also, can you maybe see if your baby (if he’s around) can help you get a letdown and then pump? (Did it take this long to get a letdown when you were nursing? Or, you could try hand expression maybe? THat might work better than a pump. I would look for YouTube videos and see if you can figure out how to do it. Then, once you have a letdown, you can pump as you normally would. Hi! I think you could do that, but I can’t guarantee anything on supply (could go up, down, stay the same, who knows) – if you increase the length of your sessions so that your total time pumping in a day stays the same that will be your best bet! Also – how long do you want to keep pumping? If 6 months, I would go for it; if longer, I might try to hold off for another month or two to protect long-term supply. Good luck! Thanks Amanda! I’m planning to stop at 6 months, so I might give it a go! I’m producing more than what my baby needs (around 1500ml whilst baby eats around 1100ml) so I guess I can always add another pump if production falls a lot…? It’ll also help with weaning I guess if I take a pump off now? Hi! It’s impossible to know for sure what will happen – it could go up, down, or stay the same. When I went down to three sessions I got my period back and that had some adverse affects on my supply. I think it depends what your goals are – if you want to pump for a year and really don’t want to supplement, I might hold off on dropping the session, but if you’re okay with supplementing or have a shorter timeframe it’s worth a shot. Make sure if you do drop the session that you increase the length of the remaining sessions so that your total amount of time pumping in a day stays the same. Good luck! Hi, your site has been really helpful to me. I am currently on 4am 7am 10am 12pm 3pm 6pm 9pm 12am schedule and my baby is 11weeks ( I get an average of 1300/1400ml in 24hours. Can I reduce a session or 2 and still maintain my supply? Plus I get clogged ducts every other day. Yes, you can do this at 11 weeks. I think you’d be fine to be at 5-6 sessions per day, eventually. Have you considered lecithin for the clogs? Many thanks for your response, I have not tried the lecithin cos I got confused with the exact one to buy( soy or sunflower). Please can you give me an idea of the times for the 5 and 6 sessions? 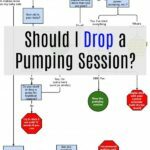 Do I need to pump for longer as I usually pump 25/30mins for the 8 pumping sessions? Hello! I have a unique situation. My daughter was born at 30 weeks and is still in the NICU, I’m 4 weeks PP. I pump 7x a day 17 minutes each and am getting about 17-18oz/day. She’s only eating about 10oz a day at this point. its been exhausting to pump this much, I’m wondering if I can drop a pump at this point but just increase the time i pump? I read somewhere that the daily time should equal 120 minutes. Also wondering when I can then drop down to 5 pumps a day, 12 weeks? Hi Stephanie! I think you’d be fine to do that – I’m sure you are exhausted with your baby in the NICU. Yes, you’d just want to increase the amount of time in the remaining sessions. And I think 5 sessions per day at 12 weeks is fine. Hi! I currently pump 6x a day and pump anywhere between 52-60 ounces a day. I would love to be able to go down to 5 pumps per day. Is that feasible at 4 months post partum without losing any ounces? If I do lose ounces how long does it take to notice the drop? Can I get the ounces back? Hi Clare! I think it’s worth a try. I think if there was going to be a drop you would notice it within a day or two – three weeks. If you do notice a drop for more than a day I would add the session back and I think you’ll be okay (no guarantees – supply is really unpredictable – just my guess). Your site has been so incredibly helpful to me. Thank you! I have slowly spaced myself out to 6 pumps, for about 30 minutes, every 4 hours. My daughter is 15 weeks and I’m (somewhat) consistent in my supply, which is around 50 oz a day. 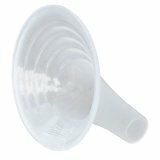 I have struggled with clogged ducts, leaking and have had mastitis once so far. I’d really like to drop my middle of the night pump. I am about to have surgery and could use a solid night sleep during recovery. What do you recommend? Current schedule: 5:30am, 9:30am, 1:30pm, 5:30pm, 9:30pm, 1:30am. While I’m okay with a slight drop, my daughter eats a lot! Somewhere between 30 and 34 oz a day. I don’t want to dip too far. I’m open to your suggestions! Hi Morgan! I think you’d be fine to drop that session. I would just do it slowly because of your history. I would push the 1:30 back each night until you’re close enough to 5:30 that you can drop it altogether. Good luck! Hi I am looking to start drastically cutting down pumps as I am approaching the point where I gave enough frozen to make it to a year which was my goal my question is I would really like to continue to pump twice a day to at least give my daughter some fresh milk but if I cut down to that will I likely just dry up? I just recently cut down to 5 per day planned to do 5 for 3 weeks then four a day for 2 weeks then 3 a day for 4-5 weeks ( to give my body a chance to adjust to the shock of all the drops) then cut to 2 what are your thoughts ? Hi Jessie! I think that’s a good plan! I think if you keep the sessions on the long side there’s a decent chance you won’t end up weaning completely. The only way to know for sure is to try it. 🙂 Congrats on getting enough frozen to make it to a year! Huge accomplishment! Thanks. At the moment I’m pumping 8 min each side (16 min a pump). Could I not keep reducing down to 6 min each side, then 4, then 2 and then stop all together? Just reduce by 2 min each week. As I’ll make less milk the less I pump so when I’m only doing 2 min on each side I’ll hardly be producing any milk. Would that work? Hi Beki! Yes, you can do that. I generally recommend one session at a time because it ensures you empty at all the other sessions which reduces the risk of clogged ducts. But lots of women do it the way you describe (I just get a lot of email from women who struggle, which is why I’m maybe overcautious). I was planning on dropping each pump by 2 mins a side slowly. So start just doing 8min each side at the same times. Then give a week and drop to 6 min a side. Will that work? Hi Beki, yes that should work! You’re planning to only drop one session at a time, right? 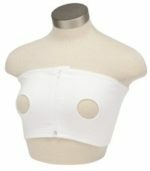 Do you wear breast pads? That will help with leaking. I want to drop a session and increase the amount of time between pumping sessions. I currently produce about 40 oz a day, so when I’m on the every three hour schedule, I get 5 oz after about 13 minutes of pumping each pump. My problem is that my breasts feel so full and hurt because of it that sometimes I have to pump every two hours. What is the trick? When I “have” to pump every two hours, do i try to get the regular 5 oz? Do i only pump for a couple minutes to relieve the fullness, then do the full pump at the 3 hour mark? I cannot a happy medium where my breasts don’t ache from being so full! Hi Kris! How old is your baby? Hopefully this will get better soon as your supply regulates. To answer your question, if you feel like you have to pump early, I would do a normal session and then do the next one 2-3 hours later. But you really can do it either way – whatever you would prefer is fine. So I am currently still doing everything I can to get my baby to the breast (I try BF at every feeding, with some success about 50% of the time). Long story short, he had a tongue tie and a lip tie and ever since the release he has been super anxious/frantic when I put him to breast. Usually the only time he will latch is if he is pretty drowsy and has had a few ounces of pumped milk in a bottle. But there are also times where he totally surprises me and will latch independently and nurse for an entire feeding without needing a bottle (however, he has only proven that he can transfer about 2.5 oz, never seen him get more, so even then I still have to supplement with a bottle of pumped milk). My question is – what should I do about scheduling pumping sessions? Right now I am only pumping after each feeding – he has dropped to 5 or 6 feedings a day from 7 or 8 and taking more at each feeding (again, mostly bottle with only some breast whenever he cooperates). I’m worried that pumping only 5 times a day will affect my supply. But I also don’t want to be on a “pumping schedule” because I want to have at least some milk in my breasts if he is ready to eat so I can try to get him to the breast (he goes anywhere from 3-5 hours in between feedings no matter how much he eats at any one feeding). I can usually get about 30-35 oz per day which is just a little more than he eats. He currently eats about 24-30 oz per day, usually closet to 24. I have about 30oz reserve right now and am able to keep that pretty regular, but it will be nice to develop more of a stash. What should I do? I would love to increase my supply a bit but also dot want to sacrifice trying to get him to the breast as much as possible, which means I need to be semi-full in order to do that. I would hate for him to actually latch (did I mention he only latches with the help of a shield?) but only become frustrated because there is little milk or the letdown is very slow. Oh and my baby is 11 weeks old. Hi! I think 5 times per day after he eats is okay at 11 weeks. I would just make sure your sessions are 20-25 minutes. Closer to 20 is fine if you think your baby is getting a decent amount of milk (like 2.5oz, versus like .5oz) while nursing. I hope nursing ends up working out – you are doing great!! Hi! Thank you for such an informative website! I am currently pumping 3x a day but I have to drop to 2x a day due to work commitment. I am quite nervous about it as I hope to maintain my supply. Base on your experience, were you able to maintain your supply when you drop from 3 to 2ppd? Hi Agnes! I wasn’t, unfortunately. I also wasn’t great about increasing the length of the sessions. If you did 2x per day with each session at 1 hour (I know it is a long time), your chances will be better. Good luck! Or even cutting out 1am and 1pm would be great. I would do 1pm and 1am. I would drop one at a time and slowly cut down the volume that you pump, reducing it by 2oz a day. So day you pump about 6oz at each session, start with the 1am and pump 4oz one day, 2oz the next and then stop. Wait a few days and then do the same thing with the 1pm. I apologize! I just realized I meant to say 10am and 1pm sessions. I guess that’s what happens when you try to use your brain while pumping at 4 in the morning :-/ is it possible to drop 2 back to back sessions like that? You could, but 7am-4pm is a really long time to go without pumping. If it is at all possible to do one session during the work day, I would try that. If not, I totally understand. (Another option is to get a hand pump and add a quick 5-10 minute pump when you can get away.) I would do the same approach I described before – drop one session at a time. Make the other sessions longer so that your total pumping time in a given day stays the same. Hello!! I need advice on cutting out 2 back to back pumping sessions before I go back to work (in a month)! Currently I’m pumping every 3 hours, 20 min each during the day 3-4 hours at night. How do I go about this without getting crazy clogged ducts? Hi Alexa! Can you post your current schedule and what you want it to be? I’m not sure which sessions you want to drop exactly. Thanks! Please help! I find that I’ve been getting sick often with cold/flu due to lack of sleep (got two young kids-one 2yo and 5 months old, working mom) with exclusively pumping and seriously need to figure out how to sleep longer. So my baby is 5.5 months old, EP only, I am at 4 pumps a day 6hrs apart (6am, 12pm, 6pm, 12am)…I pump 40 minutes at all sessions to get 30oz a day…baby is already sleeping thru the night 8-9hrs without feeding but I am still waking up every 6-7hrs to pump (over the past month I tried to pump every 5.5hrs during the day so I can pump at 7hrs at night but got into clotted ducts, all 40 minutes sessions). Is my supply even normal (not too low) at 5.5 months? What can I do to in order to get 8hrs of sleep without clotted ducts or drop in supply? Hi Briana! I would leave your schedule exactly the same except move the 12am up to 11:30 and see how your body handles it. Once that seems okay, move back to 11 and so on. Just do it very slowly. I think your supply sounds great! It’s totally normal for it to jump around a bit! I would maybe wait another week or two. How much were you pumping per day before you dropped the session? Oh and thank you for your quick responses! I appreciate your help. Not much out there for exclusive pumping ladies!! another question did your supply just grow over time or did you have to supplement it to get higher. I can keep up with my baby’s needs right now but I would like to be able to produce a little more to have extra. If I use fenugreek and power pump to pump 6oz a session instead of 4 should I raise the number of pumps too or will I go into over supply?! Hi Sam! I did need to use fenugreek to get my supply up a little higher. And I wouldn’t worry about oversupply – for exclusive pumpers it’s not a big issue because you don’t have to deal with foremilk/hindmilk imbalance or forceful ejection. Good luck! If I’m pumping just a few ounces over what my 4 week old takes in will my supply continue to grow if I drop from 8 to 7 sessions a day? I would love to drop the 1 am pump, just getting up to feed him. I don’t know if my supply has regulated but I would like to get up to 3-6 oz a pump session before I got back to work when he is 8 weeks. Should I continue to pump at 1 am until he is 12 weeks old? Oh right now I’m pumping between 2-4 oz. thanks! I think 7 sessions at 4 weeks is fine! I wouldn’t go lower than that until 7-8 weeks. Good luck! Hi, I’m 6 weeks post partum but in currently producing more than my son needs. I produce 35-37oz a day with 8 pumps at 15mins each. Believe I have regulated as I don’t feel engorged anymore and I don’t really leak. I pump at 6am, 8am, 11am, 2pm, 5pm, 8pm 10pm, 3am. I feel trapped in my apartment so I want to give myself a break in the middle of the day. Maybe something like, 6am, 8am, 11am, 4pm, 6pm, 9pm, 3am. The 3am is when he gets up to feed. Hi I was just reading your comment and I am pretty much on the same boat and was wondering how everything worked out for you and if you started the schedule that you were thinking about? I’m only 3 weeks post Partum but, want to make sure I’m pumping enough/correctly and get some advice on how to go down to 4 pumps a day for when I go back to work. Currently, I’m pumping every 3 hours for 20-30 minutes and at night, I stretch out two of my pumps to 4 hours instead of 3 and pump for 30 minutes. I am 13 weeks post-partum. My little guy was born on June 5th. I get about 55-60 oz a day on the schedule i am on. I know that is way more then i need but the sight of losing milk a day is like EEEKKKK! Thanks so much for this article! I’ve been exclusively pumping for 11 weeks and pump 5, sometimes 6 times a day! I’m pretty sure I have regulated, but a lot of people in one of my support groups made it seem like I was going to tank my supply. Knowing that you regulate by 8 weeks takes a weight off my shoulder! I never would have made it this far if I had to pump 8 times a day! Hey, this is really helpful, thanks! I have been clicking around on the site and find it to be very helpful!